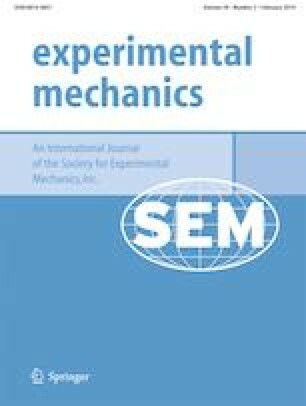 Limited methods exist for the characterization of interfacial properties in fiber reinforced composites under dynamic loading conditions since conventional techniques are designed for the measurement of a composite’s bulk properties rather than that of the fiber-matrix interface. Here, a novel experimental method is reported for the measurement of interfacial strength across various loading rates using a single fiber. The experimental apparatus uses a single fiber pullout approach along with a piezoelectric stack actuator to enable a single fixture to generate a wide range of controlled loading rates. The voltage-strain relationship is measured and the applied strain rate is controlled using resistors with varying magnitudes within a properly designed discharge circuit. The piezoelectric actuator is protected against backflow current surges using a silicon controlled rectifier, and against parasitic inductance through a toggle switch. It is shown that the proposed method accommodates single fiber specimens while providing similar performance to a Split-Hopkinson bar by reaching strain rates of up to 104 s−1, however with greater flexibility of loading rate. Single aramid fibers are tested at various strain rates and show expected interfacial shear strength independent of the embedded fiber length. The results indicate the potential of the proposed experimental method as a simple and fast technique to measure the fiber matrix interfacial properties through direct pullout at high strain rates. The authors gratefully acknowledge financial support for this research from the Army Research Office (Contract #W911NF1610229).